Goalkeeper Richard Knight has been a star performer for Stamford AFC. Stamford AFC go in search of that elusive first home win in the Evo Stik Northern Premier Division again tonight (October 20, 7.45pm). Seven matches at the Zeeco Stadium have yielded just three points from three draws for ‘The Daniels’ so far this season ahead of tonight’s clash with mid-table Halesowen Town. But Stamford, who are in 22nd place in a 24-team league, will go into the game with some confidence having won for the first time under the management of Andrew Wilson at Matlock on Saturday (October 17), mainly thanks to the brilliance of goalkeeper Richard Knight. It’s cup action for the United Counties League sides in action this midweek. Peterborough Northern Star won the Hinchingbrooke Cup last season, but they face a tricky tie at home to Stewart & Lloyds tonight. 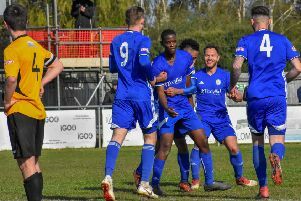 Star have won their last five Premier Division matches, but Stewart & Lloyds are the only team threatening to fight Peterborough Sports for the Division One title. Top-flight Yaxley have been wobbling of late and won’t relish a trip to Division One outfit Thrapston in the Hinchingbrooke Cup, which is now sponsored by Mick George Ltd.. Thrapston only lost 2-1 at home to Sports in the United Counties League Cup last week. Bourne host Oakham in the League Cup tonight hoping to repeat a 5-0 Division One win against the same opposition two weeks ago. Premier Division title chasers Holbeach protect a 10-game unbeaten run in UCL competitions at home to First Division Blackstones in the League Cup tomorrow (October 21). Stamford AFC v Halesowen Town. Peterborough Northern Star v Stewart & Lloyds. Boston Town v Oakham United.